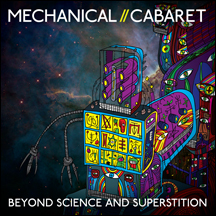 Earlier this year we introduced North America to the genius that is Mechanical Cabaret. Their greatest hits release, Selective Hearing, covered the bands illustrious 13 year existence and was a solid representation of what the band is capable of achieving. In addition to being a retrospective release, Selective Hearing also featured a new track, "Why So Serious?" This track was placed on this release to provide a glimpse of what lie ahead and build a foundation for the new album, Beyond Science and Superstition. Picking up where "Why So Serious?" left off, the duo of Roi Robertson and Steve Bellamy continue to explore unknown territories and experiment with sound manipulations. They combine hard electro with pounding beats and infectious melodies with a heavy dose of British black humor and wit. This sound is none more evident than on the tracks, "I Lost My Friend to a Video Game" and "Well, I Never." Overall, Science and Superstition is a solid release from start to finish and will satisfy their longtime fans and continue to build a solid fan base in North America.